We have in store an exotic collection of Home Furnishing Textiles. Designed using supreme quality anti-piling fabric, coupled with latest printing technolog. 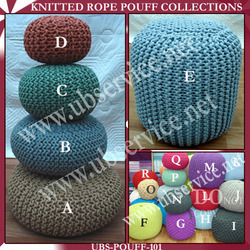 Being a quality centric organization, we offer supreme quality knitted rope pouf collections to our valued customers. They are available in exciting colors and styles. The creative team of our company ensures that they give a new look to the interior. These products are acclaimed for their accordance with the international quality standards. We offer an extensive range of Folding Dollies that is manufactured using high quality raw material. Our range of Folding Dollies is available in round shapes and in various sizes. These are appreciated for exquisite & intricate designs, neat stitching and fine finish. Avail from us an exclusive range of beautifully designed home furnishing products. Our collection of home furnishing items include enticing bed covers and embroidered cushions covers. We use finer quality fabrics for these items that add classy look and required comfort level to the end range which is gaining immense popularity in the market. We bring forth an ultimate range of Embroidered Home Furnishings that enhance the beauty of the interiors. These are crafted using quality fabrics and are offered in various designs, sizes and colors to suit match up with the interiors of hotels, homes and residences. Available at market leading rates, our range of Home Furnishings offers an elegant and attractive look to the interiors. We provide our clients an exclusive collection of Home Furnishings Textiles that is designed using various fabrics such as cotton, silk and polyester. These portray a perfect picture of latest fashion trends and are thus, used across hotels, restaurants and households. Our range is reckoned for its vivid patterns, intricate embroidery & sequin work along with smooth texture. We are talking about the Patola embroidery of Patan. Includes variety of articles such as mattress‚ blinds‚ curtains‚ bean bags‚ chairs‚ sofa‚ & other house-hold furnishing items . Offering a wide range of Cotton embroidery cushion covers. 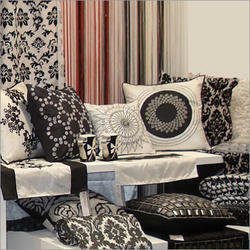 Modelama has also ventured into home textiles three years ago, offering products for windows, lounge, table, bed & bath. Servicing an elite list of clients such as Target, pottery Barn, Macy's Bloomingdales, Saks, Marks & Spencer, Dayton's Chambers, Country Road, William Sonoma, T K Max, Fallaballa, Modafill to name a few. Avail the superior quality Home Furnishings from the most trusted firm in Tamil Nadu. The variety is fabricated using the superior quality fabrics and are available in a variety of colors, patterns and designs. The Home Furnishings find their uses at homes, hotels, resorts, etc.